Naturally, incidents occur due to a wide variety of factors. However, a risk-enhancing factor with migrant workers is inadequate communication, such as limited understanding of spoken or written English, or poor comprehension of signs or signals. hazardous chemicals. Dangerous fumes created from improperly combining reactive chemicals can not only harm the worker, but also the occupants of the buildings they maintain. Without a good understanding of English, it is difficult to read warning labels and Material Safety Data Sheets. Workers may again lack the language skills necessary to ask questions and report problems to their supervisors. Language barriers also need to be considered from a legal perspective. Some courts have found language discrimination to be equal to discrimination based on race or national origin. According to the American Civil Liberties Union, an employer may not deny an employment opportunity because the applicant is not proficient or fluent in English, unless the job actually requires some English language skills, and the person does not possess the particular type and level of English language skill required to do the job. 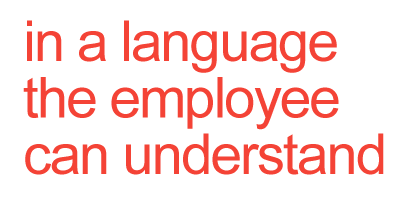 Companies across all industries should understand that language barriers will continue to grow. Continued effort needs to be publicized to businesses of all sizes that translation resources, such as eLearning training translated by translation companies, are available. Coordinated efforts with community leaders, government, educational institutions, trade associations, and labor unions are imperative so companies can fulfill their own economic needs and make sure they send their employees home safely each night.